Bob and Nancy are from Chicopee, Massachusetts, and currently reside in Solivita, Florida. They are parishioners at Corpus Christi Catholic Church in Celebration, Florida. They met Vince Ambrosetti at a mission he presented in 2000 in Chicopee called “As Streams in the Desert” and it literally changed their lives. One moment they were asking Vince what they could do to help him on the missions and now 16+ years later, they have traveled the United States assisting with 60+ Faith on Fire Missions. 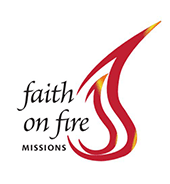 When not attending a mission, Bob and Nancy help out either at the Faith on Fire Missions office in Nashville, Tennessee or from their home in Florida. They look forward to preparing for each mission and witnessing the transformation of the parish as each night of the mission progresses.